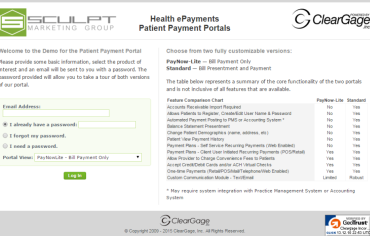 We offer solutions for a fully customizable online patient payment portal. Payment Portals increase patient satisfaction, reduce your administrative costs, and get you paid faster while providing enhanced security for your patient’s payments. Provide your patients with flexiblepatient payment options and watch an increase in your conversion ratio and practice revenue. Offer finance programs where everyone qualifies with no credit checks. A complete suite of patient payment products and solutions, including credit and debit card processing, Virtual Check (ACH) from checking and savings accounts, online bill pay, mobile solutions and more. The patient payment estimator checks insurance eligibility instantly and accurately calculates your patients out of pocket expense at the point of care. Collect payment in full or set up a payment plan. SCULPT Marketing Group has partnered with industry leaders in medical technology in an effort to help medical professionals stay engaged with their patients outside of the medical office. Interested in an ADD ON for your Medical Website? Contact Us! Our goal is to optimize the way healthcare providers do business. By developing not only revolutionary websites for the healthcare industry, but to also provide healthcare payment solutions and financial services through our partnerships that employ technology that are HIPAA and PCI compliant. Make Bill payment faster and easier for both you and your patients! 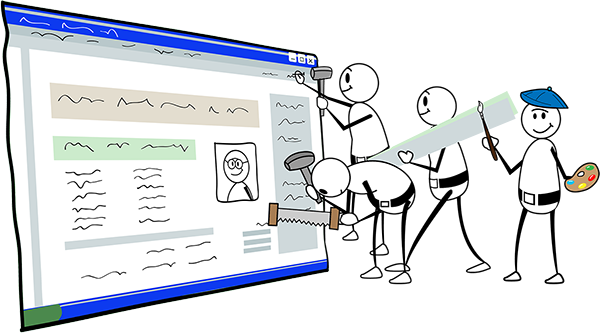 Does your practice need a new website? Contact us for a FREE QUOTE.